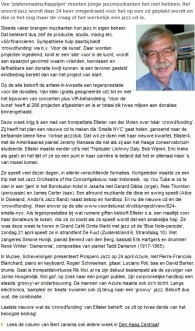 Coming weekend pianist Bob Wijnen and me shall be promoting Triplicate at Jazzahead! in Bremen. As we’re always on the outlook for new playing possibilities, this is the ideal spot to meet new people and expand our playing field. In case you will be there yourself: in between the conferences etc. we’ll be at the Dutch Performing Arts stand (B11) on Friday between 5 and 6pm, Saturday between 12 and 1pm, and at the Sunday jazz brunch with plenty of promotional material. From 1952 on Gerry Mulligan has been experimenting with pianoless quartets. He believed omitting the piano would make the band to sound tighter. The best known recordings of this setup are those with Chet Baker, but Mulligan did the same trick with several West Coast musicians such as Lee Konitz, Bob Brookmeyer and Paul Desmond. Trumpetplayer Art Farmer joined the band in 1959. The cooperation didn’t last for very long, since both players had other projects keeping them from the quartet (Mulligan founded the “Concert Jazz Band in the spring of ’60 and Farmer started the Jazztet together with tenorist Benny Golson). Fortunately they left some evidence in the form of several live recordings and a superb studio recording “What is there to say”. Together with baritone sax player Tini Thomsen, bassist Jos Machtel and drummer Niek de Bruijn (he just won the Erasmus Jazz Award) I’ll be paying a tribute to this band. So far we have two dates planned: May 2nd at the Regentenkamer and May 12th in Schiedam.